RUNNING WITH OLLIE: My Runner's Ego Will Not Choose My Pace Group! The runner's ego is a powerful thing. It gets us in all kinds of trouble. In the end it usually gets us injured. Let me give you a bit of background. I have been running for about 10 years. I was always a 10 minute per mile runner until about a year and a half ago when I started lifting weights. Almost immediately my speed increased, and I worked my way up until an 8:30 pace was just above comfortable. I could run a 5K at just over an 8 minute pace and a half marathon at a 9 minute pace. It certainly isn't considered super fast, but it was fast for me. Why am I telling you this? Because I just signed up to run with an 11 minute pace training group and my ego made me explain to you first that I used to be faster. About six months ago, something really weird started happening. I am still not sure exactly what it is, but I think I developed a type of exercise-induced asthma. I started to cough when I would run. I am fine at first, but within a mile or two, my throat fills up with phlegm and I am left standing on the side of the road hacking it up. It all goes away as soon as I stop running. It put a huge damper on my running and I ended up frustrated and side-lined. But what am I going to do? Never run again? Of course not. I had to figure out how to manage this. I started using an inhaler. I've been running again, easing back into it. There is some loss of fitness from the time off. I found if I don't push my pace at all, run really slow, and even take walk breaks, I don't cough at all. Some days are good, I feel great and I don't cough, and some days are...well, the opposite of that. So what does an all-or-nothing personality type do when she hasn't been running regularly for six months? 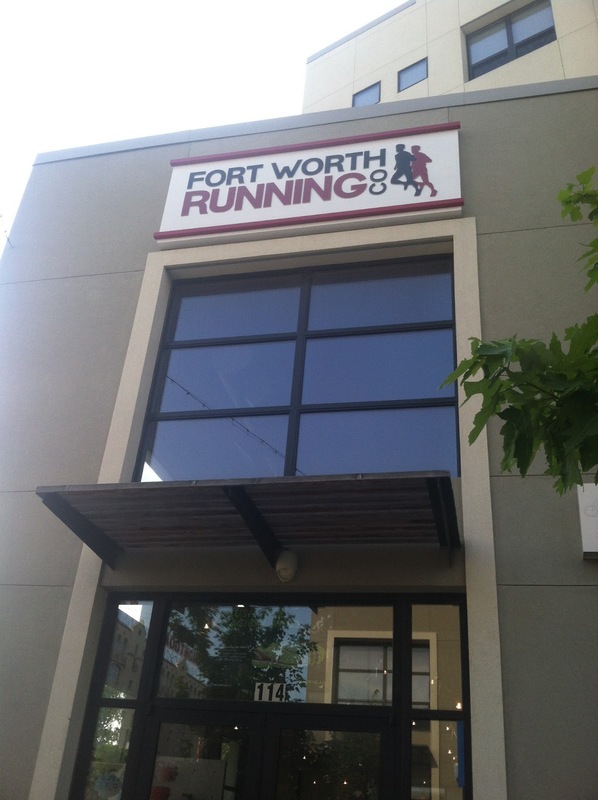 She signs up for full marathon training at Fort Worth Running Company! I decided it was the best way to jump back into it and get motivated to run again. I hardly ran at all for months, now I'm committing to a full marathon. I am excited and nervous. Excited about training with running coaches and a group for those long runs. I'm nervous about committing to 26.2 miles. I'm really nervous that my coughing episodes are going to hold me back. Then came the ego. On my first day of marathon training I had to choose a pace group. I couldn't help but think, "Aw man, why am I starting over? If I was doing this six months ago, I'd be in the 9 minute pace group." (Sigh). I knew what I had to do. I chose the 11 minute pace group because I already know that running slower keeps me from coughing. There are no scheduled walk breaks here, so I had to choose a pace that I knew I could maintain and not cough. I felt bad about having to choose the 11 minute group, but I don't know why I would feel bad about that, except for my own ego. I know better. It is not like anyone is judging me on my pace. No one else cares. It is not something I wear with shame like the Scarlet Letter. There is no shame in any pace. It is what it is. There is no good pace or bad pace. It is your pace, your level, your ability. If you run a 7 minute mile or a 13 minute mile, there will likely be someone faster and someone slower. I had to get over myself and be honest about my current abilities. Running slow trumps not running at all. Every. Single. Time. I didn't sign up for this training to prove to everyone what a great marathon runner I already am. I signed up to train to be a marathon runner. It is a six month process. Where I start is not nearly as important as where I end up. We all have to start somewhere, whether it is starting-over or starting for the first time. I could have listened to my ego and chosen the 10 minute group, struggled needlessly, and risked injury, but why? Does anyone around me give a crap care at all what pace I run? No, of course not. Who am I trying to impress? I think just my ego. The ducks don't care how fast I run (and neither does anyone else). Does anyone out there have exercise-induced asthma (or coughing)? 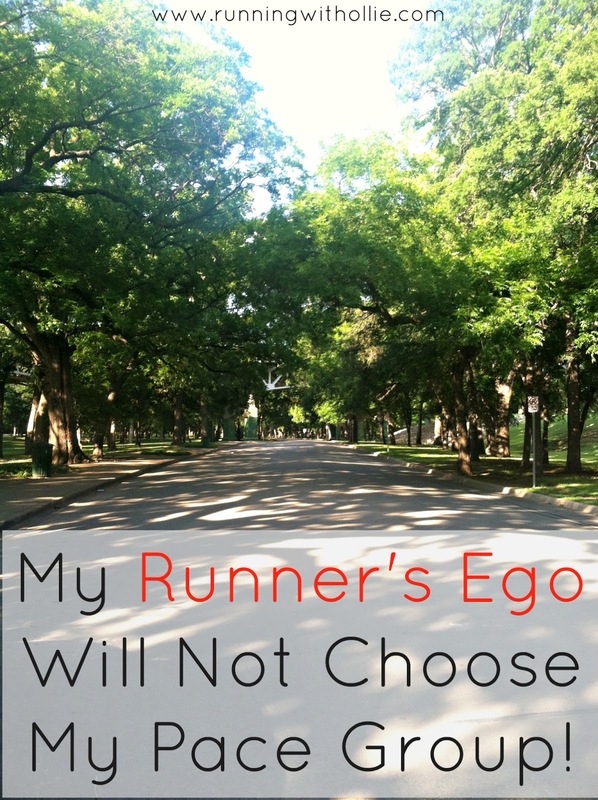 Does your runner's ego ever get in the way? Will you follow along with me as I begin my full marathon training? All the best with your training! I think you are wise to put the ego aside and do what is best for you now. I get exercise induced asthma, but it usually doesn't hit until after I am done running. After a long hard run, I am usually coughing quite a bit. I am fine with short distances (depending on how hard I push myself), but if I do try to sprint the last mile, I will get myself in trouble. I am also quite phlegmy when I run, but it doesn't sound as bad as what you are going through. Kudos on keeping your ego in check, that would be hard for me, as I usually push myself through injuries. Good luck on your marathon!!! I think you made a great choice. You can always move up to a faster group as your speed comes back. Which marathon are you training for? I am training for the Dallas marathon in December! I hope you have a great time with your training. Good choice, I would say. You can always change if you find you need or want to. I am a slow runner. My pace is sometimes more than 11 minutes a mile (being in Canada, I am around 7:30 to 8 minutes a kilometre). Sometimes, this bugs me because *everyone* in my run club is faster than me. I am *always* the caboose. But then I remember that it matters not how fast I am, the effort is more important. It is hard on the ego, and takes time to be at peace with our "happy pace". We want to be as fast as our friends, or as fast as people we know posting good times at races. We feel inadequate if we are slower. thanks for posting this. I needed to read this today. Been struggling with some inner critic voices saying "get faster, you are too &%^*ing slow" lately. best of luck in your training, and I hope the coughing and ick stays manageable. A couple of thoughts (likely you have already thought of this stuff since you are awesome) is how much dairy do you consume before running? Dairy can thicken mucous secretions directly after consuming milk or yogurt or something. Also, think about clearing your nose before a run (neti pot, saline spray, nasonex). If the cough is from runner's rhinitis, you can mitigate the post-nasal drip this way. Thank you so much! I did not think of either of those things, so I will definitely try it next time out! Thanks for the tips! you rock! I am seriously considering registering for a full marathon. 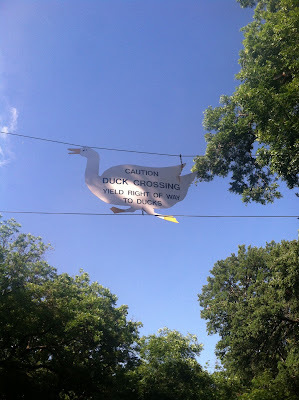 My last one was 10 years ago, and I don't want another year to slip by without running on. I feel like I'm a much stronger runner now than I was 10 years ago, but I also feel like my ego is kind of already getting in the way. Oh, I've got this. I've done it before. In reality, I know I'll need a lot of mental checks to make sure I'm not overdoing just because I've done it before. Today signed up for my first full. We have got this!!! Good for you and very smart training you have started! Best of luck to you! Runner's ego is quite strong! Good for you in getting back to running and for listening to your body. Better to continue running a little slower than not being able to run at all. Good job! Yet again, Lea, you make me feel so much better about myself. "There is no good pace or bad pace. It is your pace, your level, your ability." and " Running slow trumps not running at all. Every. Single. Time." are exactly what I needed to hear. I hope your marathon training goes very well and your asthma stays far away. I've been the "icky lung girl" most of my life and know how you feel. Just catching up on your blog. Best wishes to you in your training! Coach Jim is a friend of mine and really knows how to encourage runners. I hope you enjoy every bit of it!